The latest device to take advantage of the advances in communications technology is a wireless headset designed specifically for firefighters. It allows them to be wirelessly connected to the in-cab intercom system, at the pump panel or within 90 feet of the base station. The headset, developed by Oregon-based Firecom, is the first of its kind to be designed for the fire service, said Sarmad Hannosh, the lead engineer behind the project. "Headsets have always been wired, plugged into headset modules mounted on various spots around the fire truck," he said. "For pump panel operators, they have to get out of the truck at the scene and plug their wired headset into the headset jack at the panel. "A wireless headset makes all of their jobs easier and gives them the capability and flexibility to move around and not be tethered to the truck." This technology, Hannosh said, could also help to reduce the safety risks posed to spotters backing-up fire trucks, since it eliminates the need for their headsets to be physically connected to it. Work on the headset began about 18 months ago and initially focused on using Bluetooth technology. However, Hannosh said the company encountered two major problems with a Bluetooth headset: a high frequency, resulting in a lower transmission range, and the fact Bluetooth's strength lies in the transmission of data rather than voice communications. "We tested a Bluetooth prototype last year, but after a few weeks we decided it was not going to meet our requirements for it to be used on a fire truck," Hannosh said. "It didn't offer the same robustness as the technology we are using now, of being immune to interference and immune to communications break up." Firecom's system is designed to handle a large number of headsets in the same vicinity, according to Hannosh, with the headsets and base stations incorporating "antenna spatial diversity" for a strong RF link. The wireless system has two base station configurations; the one-channel model uses one radio transmit headset while the five-channel model works with up to five non-radio transmit headsets. Hannosh said the system allows up to 40 wireless headsets to operate with any combination of base stations in close vicinity to each other, with no cross contamination of transmissions. "Devices operating on this technology have the capability to monitor interference from other similar devices," he said. "If it encounters a significant amount of interference on the specific channel that it's operating on, it keeps scanning out for other channels that are not as prone to interference." The headset then initiates a request to the base, requesting that it transfers to another channel, Hannosh said, a process that takes milliseconds. 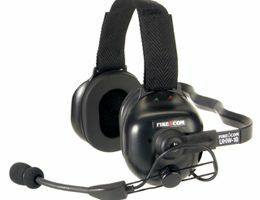 Firecom has produced three versions of the headset: the UHW-10 (under the helmet style with a momentary PTT button for radio transmit), the UHW-20 (under the helmet style with a black momentary PTT button to key in the microphone), and the FHW-10 (over the head style with momentary PTT button for radio transmit).